GUMNUTS.....AND OTHER STUFF: West Australian Wildflower Trip - 7th Day, Stirling Ranges. 15th Sept 2014. West Australian Wildflower Trip - 7th Day, Stirling Ranges. 15th Sept 2014. The main attraction of today's, and possibly the whole trip, will be the Stirling Ranges. This area is one of the worlds flora hotspots and we will not go home disapointed. As well as the national park we will be wine tasting and having lunch and at Gilbert's Winery and later in the day visiting the Banksia Farm. A very full day coming up, so hang onto your hat and away we go. A blanket of canola escorts us to the Stirling Ranges. The road to Eastern Lookout. Driving up to Eastern Look out. Cyanicula sp. (sericea – Silky Blue Orchid? ), Just to show leaf shape of another orchid and not sure. Kingia australis (Black Jin) resembles the grass trees ( Xanthorrhoea sp) but are quite distinct and are not closely related. There were more peas here. This pea plant had a unique shape. Gastrolobium celsianum - Swan River Pea. Colours were not just resticted to the flowers. I don't know what this very structured plant is. Jan on the path below Bluff Knoll. Darwinia leiostyla - Mountain Bell, a beautiful flower. Clockwise: Sphenotoma dracophylloides?, Dryandra / Banksia sp. (arctotidis - Fern-leaf Banksia? ), not sure. Hakea ambigua: Sweet Scented Hakea, Grevillea sp.G. fasciculata, and Leucopogon sp. ? Kingia australis is a stand-out in this habitat. Snow can fall on these peaks. The plains below the ranges. Time to leave this magic place. 9 km's back along Chester Pass Rd. A collection of Caladenia flava – Cowslip Orchids. Showing slight differences in petal/sepal shape, red markings and colour shading. Caladenia flava – Cowslip Orchid. Stirling Ranges WA. Caladenia flava – Cowslip Orchid. I didn't notice the hairy underside of the petals/sepals in the field. Isopogon dubius - Rose Pincushion, Coneflower Pincushion. Clockwise: Pimelea sp., Petrophile divaricata ? , Chamaescilla corymbosa - Blue Squil and Leucopogon sp. And still they come ........ so many species. Clockwise: Kunzea?, not sure, Dryandra sp. and Grevillea (G. saccata - Pouched Grevillea?). Driving through the Stirling Rangers National Park. 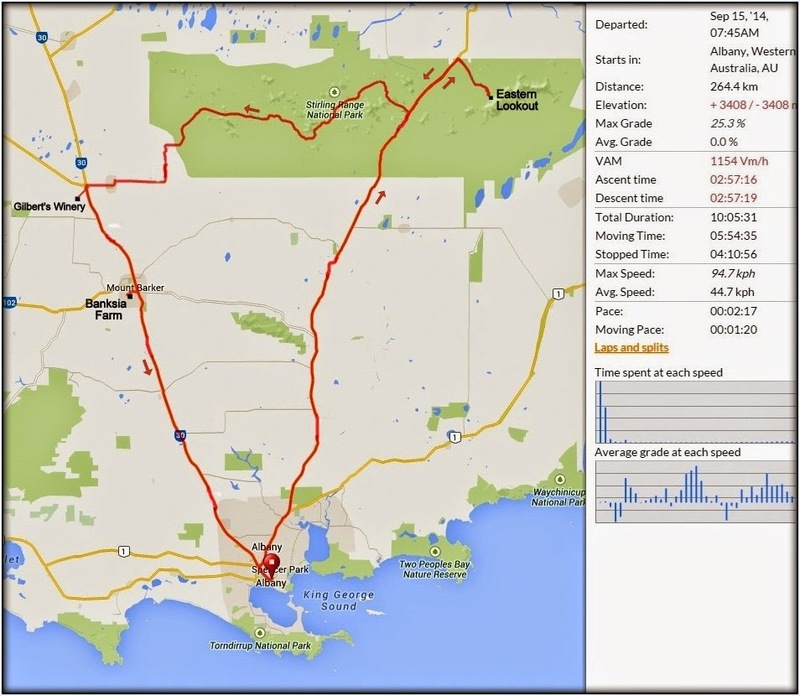 12 km's along Stirling Range Dr. These yellow flowers caught our attention. Busy looking and taking photos. Clockwise: could these 3 tiny plants be Triggerplants?, Dryandra sp. and no idea. As you can tell, by where the bus is parked, there's not a lot of traffic on this road. Clockwise: Calectasia sp. - Tinsel Lily, Hakea sp., Lysinema ciliatum - Curry Flower. Caladenia discoidea – Dancing Spider Orchid, Antelope Orchid. All aboard please, we'll find plenty more along the road. Mount Trio, Stirling Ranges, WA. And 5 minutes further on. "I think this is an orchid"
...........and, as at all the other stops, there certainly were. CW: Lemon Scented Sun Orchid, Cyanicula sp. (C. sericea – Silky Blue Orchid? ), Cyanicula sp. (C. gemmata – Blue China Orchid? ), Jug Orchid, Purple Enamel Orchid. Check out the great soil the Swamp Daisy (Actinodium cunninghamii) thrive in. 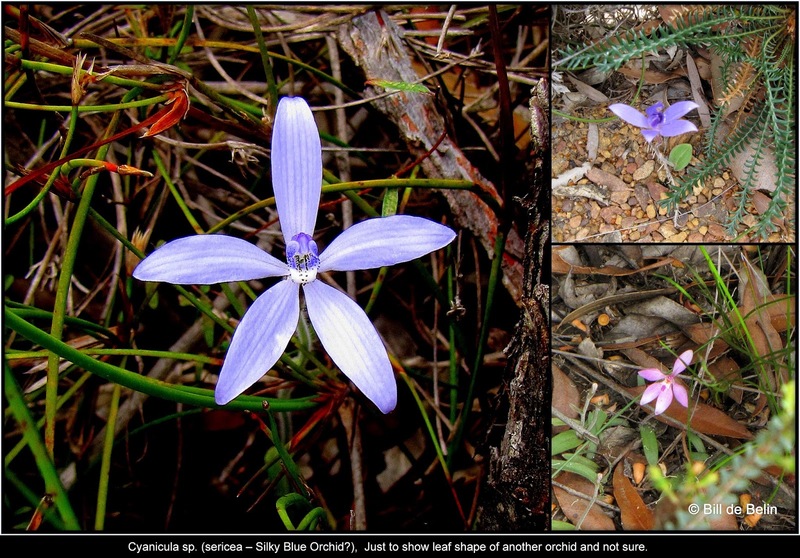 Colour variations in Actinodium cunninghamii - Swamp Daisy, Albany Daisy. CW: "not sure what 'little fluffy arms' is, I found one reference to this one 'Goodenia beardiana' but not sure if that's correct Velleia macrophylla - Large-leaf Velleia, and Calytrix sp. More peas. Righy: Nemcia/Gastrolobium leakiana - Stirling Range Poison, Mountain Pea. Something in the Rutaceae family?, Hakea and a Petrophile ? Beaufortia cyrtodonta - Stirling Range Bottlebrush. The bus, again, waits patiently. Now heading to Gilbert's Winery for lunch, near Kendenup, in Western Australia's 'Great Southern Wine Country'. Part of the gardens at Gilbert's Winery and Cafe. Rhodanthe chlorocephala - Rosy Everlastings. Western Rosella feeding on the blossoms at Gilbert's Winery. Splendid Fairy-wren in the gardens at Gilbert's Winery. Something different, a display of spring bulbs. A sample of the Banksia collection. Some non-banksias around the house. They never get a frost here, but this was the coldest stop we had on the trip. Like a decorated Christmas tree. Eucalyptus caesia with its 'minniritch' type bark. The best I can do with the 'strawberry' fungus/slime is “Karri Cushion Fungus” Hypoxylon aff. subrutilum. A cool temperate garden, not something I expected to see in WA. Scroll to bottom of page, Click on 'Older Posts' to go to Day 8 (next day). Cameras: Canon PowerShot SX10 IS and Sony DSC-W690..